The iPhone has come a long way since it was available exclusively on AT&T. Remember that? There are literally dozens of service plans to pick from now on all four nationwide carriers. Making sense of all the options can be dizzying. Do you buy or lease? Do you care more about network quality or price? Do you want a contract, or would you prefer to pay in installments? To sign up for the right plan for the iPhone 6S or 6S Plus (on sale Friday), you have to understand your own cell phone habits, and figure out what's most important to you first. 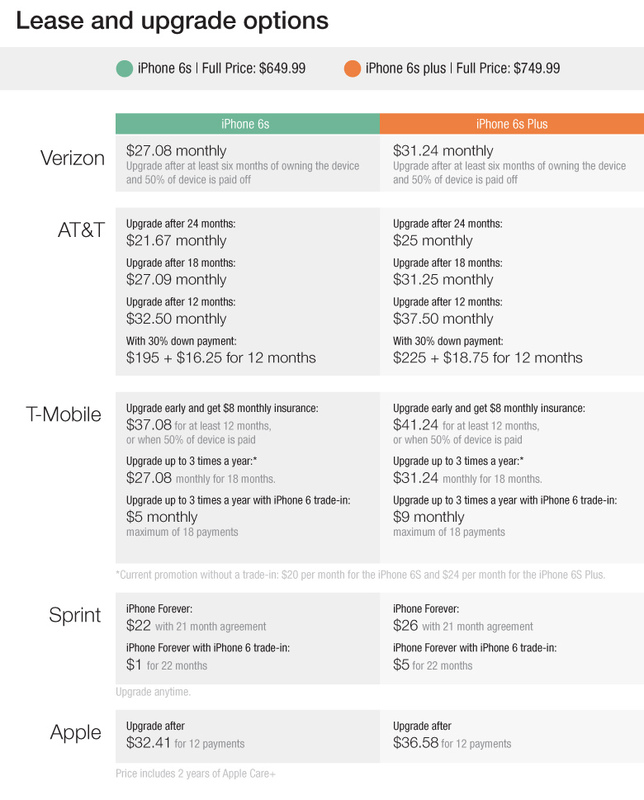 To help you decide which plan suits your budget and phone usage best, CNNMoney studied device deals and service packages from Verizon, AT&T, T-Mobile, and Sprint. We also examined Apple's new iPhone Upgrade Program and payment plans. There is no one perfect plan, but each has its benefits. Do you want to have a new iPhone the moment it comes out? Then sign up for a lease or iPhone upgrade program from T-Mobile, Sprint, or Apple. Sprint: Of all the lease and upgrade plans, Sprint's (S) "iPhone Forever" plan is the cheapest. Right now, you can lock in a promotional $1-a-month deal for 22 months for an iPhone 6S with the trade-in of an old smartphone. Without a trade-in (or whenever the promotion ends), you'll pay $22 a month for 21 months. A 6S Plus will cost four dollars more per month. T-Mobile: T-Mobile (TMUS) just slashed monthly lease prices on the iPhone 6S and 6S Plus to $5 and $9 per month with an iPhone 6 trade-in. The limited time deal is part of T-Mobile's "Jump On Demand" plan, which gives you the option to upgrade to a new phone up to three times a year, and T-Mobile kicks in insurance for lost and stolen phones too. Joining Jump On Demand is an 18-month commitment. After 18 months, you can choose to pay $164 to keep the phone, give it back and start another lease in exchange for a new phone, switch to a monthly installment plan to buy another device, or leave T-Mobile. Apple: Under Apple's iPhone Upgrade Program, you'll pay $32.41 per month for a new unlocked device. The price also includes two years of AppleCare+, which covers hardware repair, software support, and two accidental damages. Some things to consider with these plans: First, you don't get to keep your old phone once you upgrade. Apple iPhones retain their value better than any other smartphone, so you could miss out on a chance to sell your old phone on a booming secondary market. Second, if you don't want to give your phone back, you do have an option of buying it at the end of your lease. But you may end up paying more than the retail price. T-Mobile is the exception: You actually end up paying $125 less than retail price if you choose to buy your phone after your lease is over. Third, each phone upgrade restarts the clock on your lease, so you pay for phones in perpetuity without ever owning your device. Do you want a two-year contract? Sprint and AT&T are your only options. You can no longer get a contract plan on Verizon or T-Mobile. Though contracts are no longer in vogue, many people still like the comfort of giving their carrier a down payment in exchange for a guaranteed monthly price for two years. 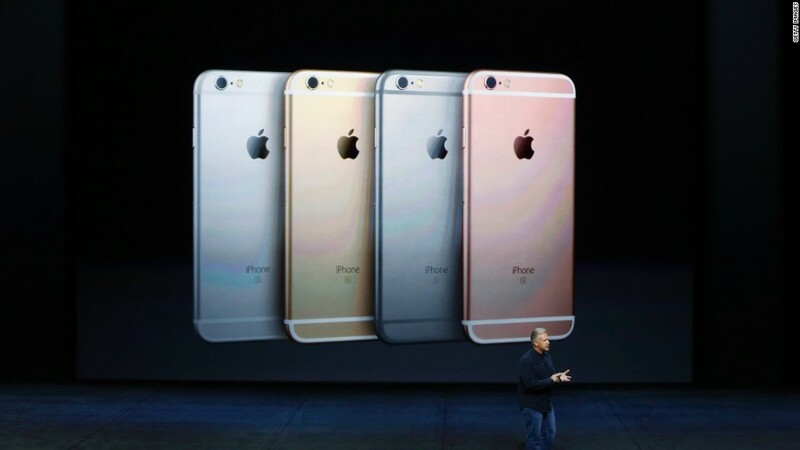 Both Sprint and AT&T will let you pay a $200 and $300 down payment on a new iPhone 6S and 6S Plus. The catch is they'll penalize you for signing up. 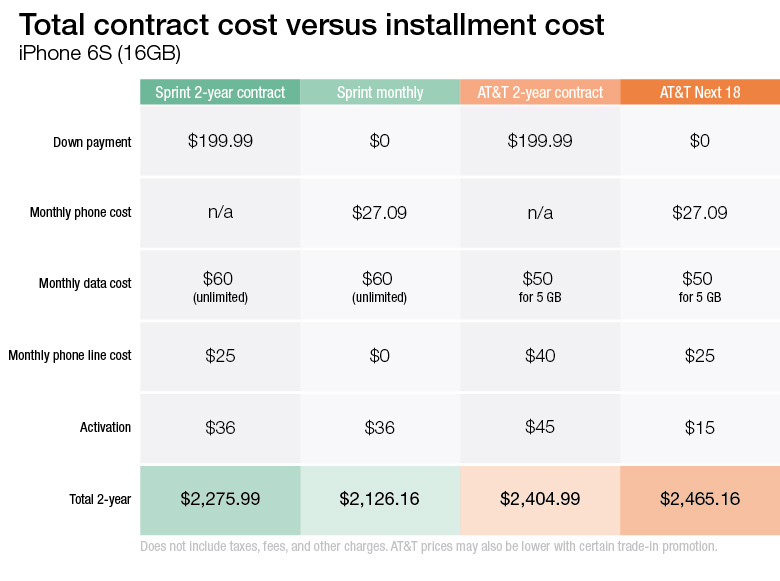 Sprint charges an extra $25 per month if you sign a two-year contract. AT&T charges $15 more for its "Monthly Access Charge" and $30 more on the activation costs for two-year contract lines. Are you unhappy with your carrier? If you're looking to switch, Verizon has the simplest plans to understand, and AT&T gives you the most payment options. Going off-contract gives you the advantage of playing the carriers off one another. Once you've paid for your iPhone in full, you can use Sprint's service one month, then switch to AT&T the next month, and so on. Each carrier also has its own quirks. Verizon: Verizon (VZ) is generally the most expensive, but the company's plans are also the easiest to understand. You have just four buckets of data to choose from -- and that's it. You can pay for your phone upfront or over the course of two years, with an option to upgrade after 50%of the device is paid off, and you have the phone for six months. AT&T: On the other hand, AT&T offers lots of choices, making it cumbersome to make exact comparisons. AT&T (T) still lets you sign a two-year agreement for a new iPhone, but it also lets you pay to own or lease a phone through four different monthly installment plans. You can pay off your phone in 30, 24 or 20 installments with the option of trading in and upgrading after 24, 18 and 12 months. Oh, or you could pay a 30% down payment, divide the remainder of the cost over 28 months and upgrade after 12 months. Got all that? Sprint: In general, Sprint will give you the lowest cost on a phone and service plan together -- especially if you want an unlimited data every month. Do you just want to pay the least amount possible for your phone and phone service? Go with Sprint or T-Mobile. Sprint: After two years of Sprint's "iPhone Forever," you'll pay about $1,500 for an iPhone 6S, and the monthly voice and unlimited data plan. (You won't be able to keep your phone, though). If you want to own your device, Sprint also has the lowest total cost for a service and phone bundle through its 24-month installment plan, costing about $2,200. T-Mobile: Combined with a voice and 3 GB data plan, you'll pay about $2,000 to $2,100 in total at the end of two years for an iPhone 6S or iPhone 6S Plus. AT&T: To complicate things, AT&T is offering up to $300 in credits for certain smartphone and iPad trade-ins for a limited time too. That works out to about a $13-a-month discount over two years. Verizon: Verizon will give you up to $400 to trade in your old phone. Over the course of two years, that's a $17-a-month savings. That means, with a trade-in, Verizon and AT&T's deals are just a few dollars shy of Sprint and T-Mobile's current promotions. Plus, Verizon and AT&T will let you keep your new phone. Ultimately, to keep the cost of your cell phone usage down, use a new iPhone for more than two years. You'll have likely paid it off after 24 months, and will then only need to worry about the cost of a service plan. Note: Our analysis is based on individual phone lines for customers with good credit. Carriers may require additional deposits for customers with credit issues. Calculations do not include any up front or recurring taxes and extra fees. 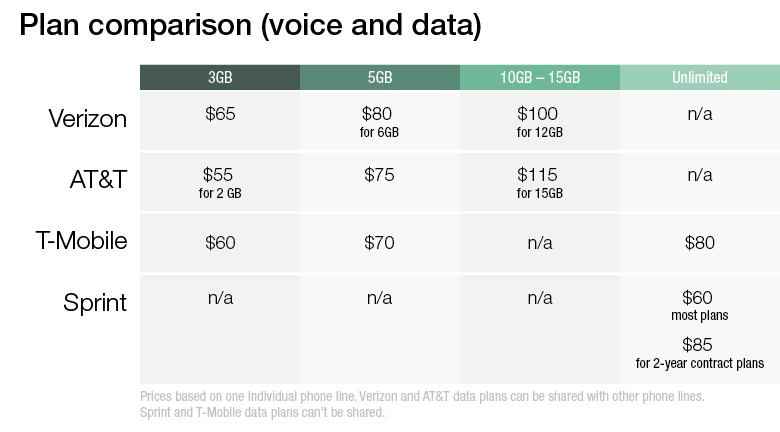 Verizon and AT&T data plans may be cheaper per line if shared. 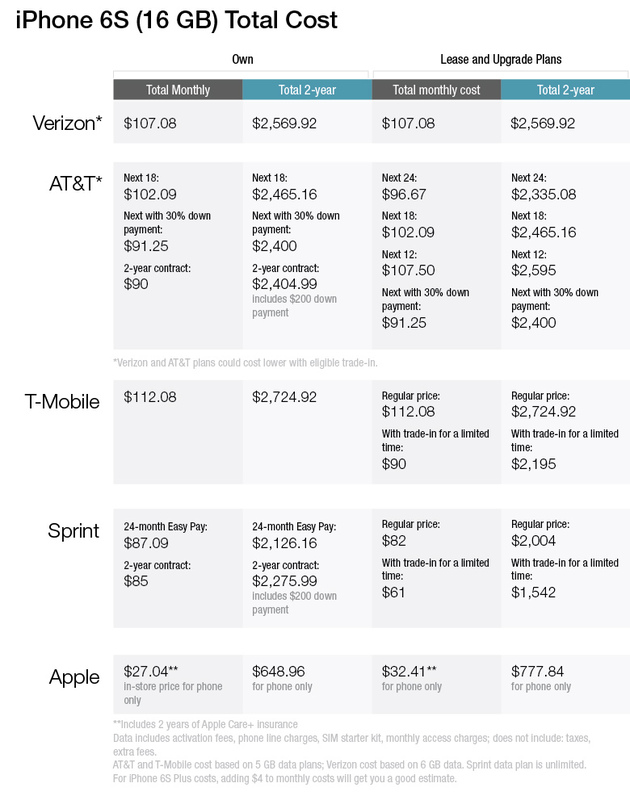 Correction: An earlier version of the "Plan Comparison" table misstated the cost for T-Mobile plans.